Severed is about Western culture’s fascination with severed heads throughout history. The book begins with Larson’s own fascination with the shrunken heads in Pitt Rivers Museum at Oxford, where she worked. Apparently, they are quite an attractive exhibit there, drawing lots of fascinated people – adults and children alike. The shrunken heads were made by Shuar and Achuar peoples from South America, ranging from Peru to Ecuador. The heads were considered to have the power of the souls of the former owners, and when the heads were shrunk, the Shuar and Achuar people were able to harvest that power. The shrunken heads were made by removing the brain and skull. The skin of the head was then put in hot water and filled with scalding sand. The sand treatment was repeated several times until the head shrunk down to the size of a fist. Interestingly, after the heads were shrunk, they no longer had any power. Therefore when Westerners became interested in the heads as novelty items, the Shuar and Achuar people were happy to sell them. Even Westerners wanted a piece of the shrunken head profit: they would fake the heads using heads of monkeys. Anyway, Larson’s story of severed heads did not stop there. She discussed trophy hunting during Pacific, Vietnam, and Korean Wars. It’s surprising what a soldier might do when he is in the foreign world of kill-or-be-killed. Again, the idea made me feel sad. She discussed the sloppy ax beheadings of convicted criminals in the days before the guillotine. How an executioner would be praised by his ability to cut a head clean off, and would be shouted down, beaten, and possibly killed because of a sloppy execution. Because higher society became more “refined,” they decided that the rowdy crowds that executions attracted were disturbing – so they invented the guillotine. The crowds were disappointed by how quick and effortless the executions were, but the executions certainly became more humane. Larson finally discussed phrenology, plastination, and dissection of heads by medical students (modern and in the old days of stolen corpses). Until she got to the plastination part, I was feeling rather fascinated but disgusted – actually a little high-and-mighty that I certainly did not find dead heads fascinating. (Yes, I recognize the internal contradiction in that sentence.) But then I realized she had a point. I was fascinated. I was fascinated by her book. And when the Bodyworlds exhibit came to the Science Museum of Minnesota, I sure did rush out there to see it. And I didn’t find it disgusting. Of course, there’s a difference between Bodyworlds versus collecting the heads of unwilling donors – the people of Bodyworlds all donated their bodies to this “art” project. In fact, I find mummy exhibits to be a little wrong. Larson claims that our disgust at the collection of heads is rather a new concept – it isn’t inherent in humans. I find that a little hard to believe, but I recognize that some things that seem naturally right to me were not always “right.” For instance, homosexuality. Not more than a couple decades ago homosexuality was listed in the DSM as a psychological disorder. Now it’s mostly accepted as normal behavior for some people – and the idea that it was considered a mental illness is laughable (or insulting, depending on what personality type you have). So why can’t the same thing be said of my own uncomfortableness about severed human heads? 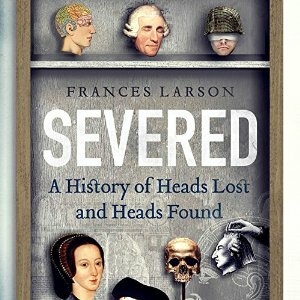 But I’d like to point out my own argument against Larson’s point: if people of the past didn’t find the idea of severed human heads a bit off-putting, then why were they so fascinated by the idea? Larson’s book was a fantastic read for the Halloween season. It was creepy, fascinating, and creative. The research seemed quite diverse and the narrative was engaging. I really think there’s a lot to learn from this book – at the very least it will make you rethink your own views on the subject of dead heads. 4.5 stars for creative subject, research, and engaging narrative. I agree, this book sounds fascinating. I likely would not find it too troubling or disturbing as it sounds like it does not delve too deeply into pain inflicted on the living. Things like usually bother me a lot. Yeah, I'm really glad that I read it even though my book club rejected it. 🙂 I was surprised at how few reviews it had on my favorite review sites (which doesn't include Amazon, though there are only 21 there – which is relatively few). I found this book on a list of “must-read nonfiction” so I figured it would be more popular than that. It was. You should try it out sometime. It went fantastically with the Halloween theme.